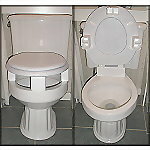 A 3-1/2" raised toilet seat with removable arms works with your existing toilet seat and lid for a more pleasing look! Elevated toilet seat is available in three height options and includes a comfortable, contoured seat with Slip-in bracket for added stabiliy. 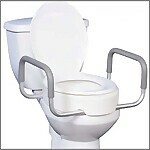 Raises toilet seat by 3-1/2" to 4" when used with your existing seat with an added hinged benefit that makes cleaning easier and is ideal for households with men who would like to lift the seat. The extra large design of this splash guard helps direct urine flow into the toilet and can be used with most regular toilet seats and most elevated toilet seats. 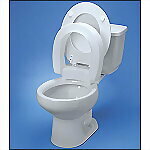 Add 5 inches of height to your toilet with our E-Z Lock raised toilet seat. 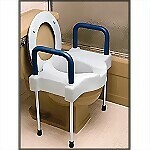 This seat locks in place within seconds and is perfect for those with bending difficulties. 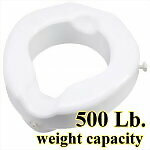 This unique Bariatric raised toilet seat features a wider opening, smooth curve design, and support users weighing up to 500 lbs! 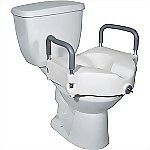 Includes a safe lock system that secures the seat to the toilet bowl for additional safety and raises height by 4.25". This unique foot positioner places your body in a more natural squatting position for a more comfortable and complete bowel movement. 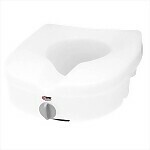 Raises height 4" above toilet and includes an Aluminum frame with soft, foam Madda-Comfort® Armrests for gripping support and a Slip-In Lok-In-El® Bracket with the added security of adjustable floor legs for the ultimate in user stability. 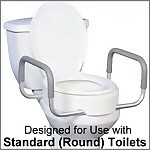 Raises height 5" above toilet and includes a locking safety mechanism and soft foam tool-free removeable Armrests for additional gripping support. 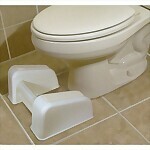 An alternative to Raised Toilet Seats! 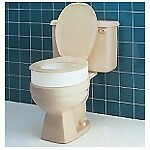 A discreet way to add 3-1/2" of height ot your toilet base base without altering the actual toilet seat. Installs on the base of toilet. 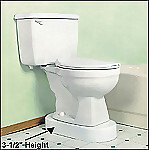 This toilet riser adds 3.5" of height to your existing toilet to make sitting and standing easier, while the hinged benefit allows for easy cleaning and is great for men who need to lift the seat. 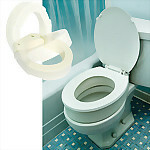 Raises toilet seat by 3-1/2", while providing a non-prosthetic look as it fits conveniently under your current toilet seat & lid. 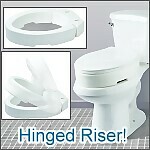 The hinged toilet riser raises the toilet seat 3.5" and hinges to make it easy to clean. 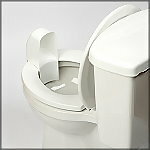 The two piece unit locks together and will raise up with the seat to allow the user to wipe down under the riser. 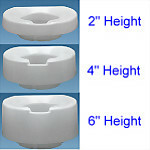 Four piece toilet riser set attaches to existing toilet seat with simple installation and elevates the seat height by 3".